Magnetic energy is a key principle of both Far Eastern cultures and traditional Chinese Medicine. This principle has led to the development of practices such as acupuncture in the Western world. Nikken magnetic technologies have been developed for over 40 years to provide a carefully designed, supportive environment, and Nikken’s magnetic products are designed to fit easily into our normal day-to-day lives. This can be in the form of our Sleep System using products such as the Naturest® Kenkopad® and the Duvet Cover, via special magnetic insoles – Kenko mStrides® or even harnessing this magnetic energy whilst sitting down in the form of the KenkoSeat®. 1. One result is that the magnetic field is intensified in each of these areas, providing 100% magnetic coverage of a complex field within a flat surface. 2. The other is a magnetic field that extends farther from the surface and increases the depth of penetration. This equates to increased gauss strength (the measurement of magnetic flux density). Patented DynaFlux® Magnetic Technology is at the foundation of the KenkoTouch® and the MagCreator®. The KenkoTouch® is a small handheld device that delivers pulsating magnetic wave therapy that may help relieve muscles discomforts. The massaging effect leverages the mechanical motion of strategically placed moving nodules; that produce a firm, slightly yielding sensation. The MagCreator® also harnesses this technology to specifically target the back. The specially designed magnetic head is engineered to roll fluidly down the spine and may help soothe tired, tense muscles. 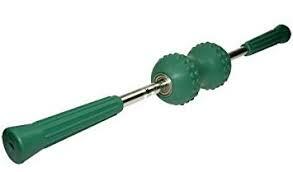 The surface nodules add an extra level of massaging stimulation. This can be used either on yourself or on others for that extra level of relaxation. The MagCreator® is currently available with a saving of 50%. Please visit the online store here.